So, it turns out yesterday’s Rhino-coated 1991 BMW 325iX wasn’t ribbed for anybody’s pleasure. Okay, so it was more pebbled than ribbed, but you get the idea. Spray-on bed liner can prevent damage from minor banging around, or it can be used to mask existing scars. What it couldn’t mask was the 74 percent Crack pipe loss suffered by the Bimmer’s $4,800 price. Honestly, nothing’s going to cover that up other than a big half-off sticker. Hi. I’m one of one. There are many that may seem to be like me, but from my finger prints to my DNA I am unique. That doesn’t necessarily make me special, no matter what my mom used to tell me. This is 1991 1Le that is 1 of 478 combined auto & manual trans, 1 of 303 5 speeds and 1 of 1 with a 5 speed along with black and tan leather which means it is has a very nice future. You will not find another 1le like this one. Okay, so first off, what the hell is a 1 le, right? Well, it turns out it’s long been a bit of a secret. The designation was applied to a series of options Chevy compiled that were intended to make the car competitive in the SCCA’s Showroom Stock series. It’s rumored that Chevy didn’t promote the package because the company felt it was too much to handle for the street. Yes, they were just looking out for our best interests. Thanks Dad. The 1LE package wasn’t even on the Camaro’s option list. Instead you had to first order an IROC Z with either the 305 or 350 CID engine, then add to that the ‘performance rear axle.’ Finally, you ordered the A/C delete option which magically instituted the addition of stiffer springs and re-tuned shocks plus bigger brakes, heavy duty suspension components, an aluminum driveshaft and a baffled gas tank. The first year offered—1988—Chevy built four. By 1991 the IROC Z had gone the way of all corporate sponsorships. That meant the 1 LE package transitioned to the Z28 as is the case with this unique monochrome black over butterscotch edition. That color combo really does stand out, as does the car’s condition. It should be pretty nice since it only sports 10,000 miles on the clock, and according to the ad was once sold at Barrett Jackson. As you know they generally do pretty choice stuff. We do get a shot from that auction, however for a car touted as being so special we don’t really get much of a tour otherwise in the ad’s pics. Oh well, we’ll just have to make do. Along with the nice color combo and the 1 LE stuff, the car comes appropriately kitted with a 230 horsepower TPI 305 V8 and 5-speed stick. The 350 available the same year offered up fifteen more ponies, but could only paired with a mechanical succubus automatic. The seller claims the car not to be in just as-new condition, but the always more desirable better than new shape. The paint looks solid, as does the vinyl, leather, and plastic on the interior. It’s described as 100% stock and to even carry that lovely new car smell rather than the unpleasant mix of Axe and frat boy wasted potential that is the typical effluvium of a used Camaro. The price is a steep $31,000, which is even more than the car went for at auction almost a decade ago. Is that how these things work? The ad claims that 1 LE cars are trading for twenty grand more and notes that at more than 25 years old, this one is eligible for senior discounts on registration and insurance. Wow, with all those savings, it’d be stupid not to buy it, right? 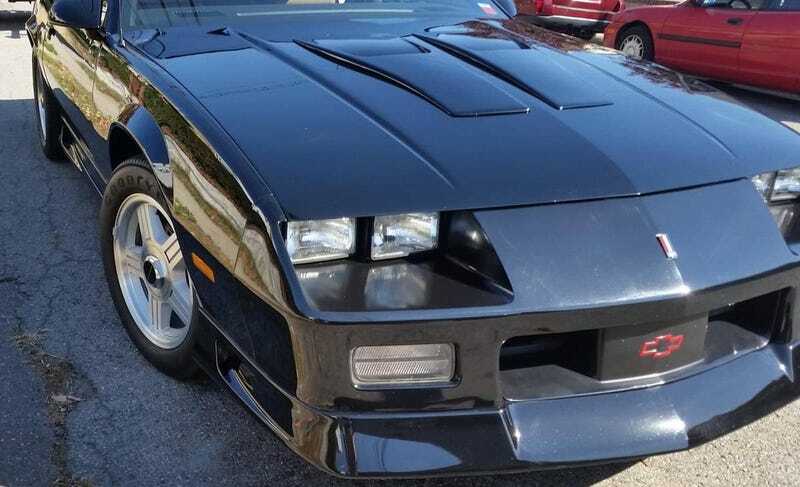 What’s your take on this pristine and one of one Z28 and its $31,000 price? Does that price seem fair for a car so rare? Or, is the seller reaching for straws with its uniqueness while at the same time he’s reaching for our wallets? Westchester, NY Craigslist, or go here if the ad disappears. H/T to GardenStateParkway for the hookup! At $13,750, Will This 2000 Chevy Camaro SS Blow You Away?